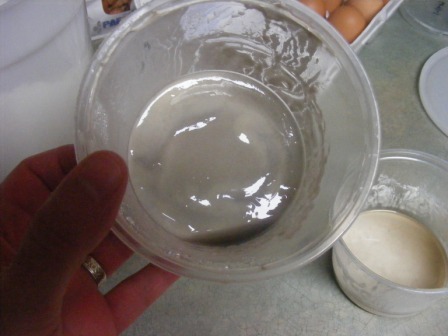 A lot of people have written to tell me that my foolproof sourdough starter has worked for them. 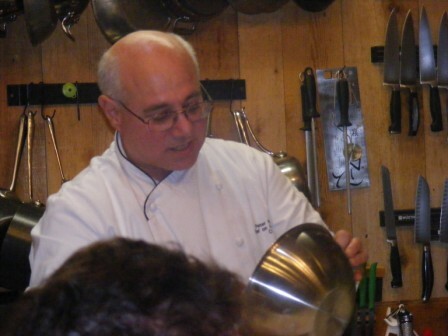 Many of them had tried numerous times to create their own starter, only to give up at some point in the process. 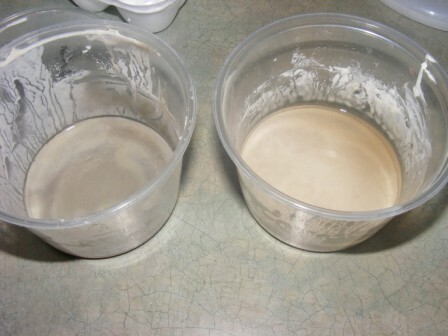 Following my tutorial, though, they’ve found what others have discovered: anyone can create a successful sourdough starter. 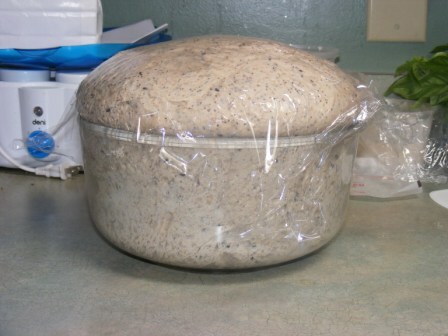 The good news is, it’s almost impossible to kill a healthy starter. They can take a lot of abuse and neglect and still bounce back. And believe me, I know this from experience. 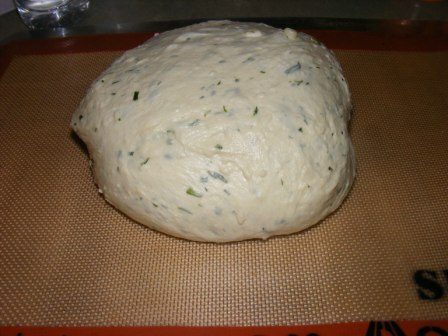 As noted in my tutorial, I keep my starter in the refrigerator, since I don’t bake with it all the time. 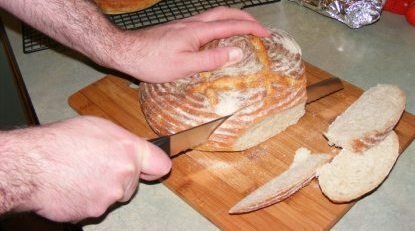 When I was first learning to bake sourdough bread, I baked with my starter every week, keeping it in the fridge between bakings. 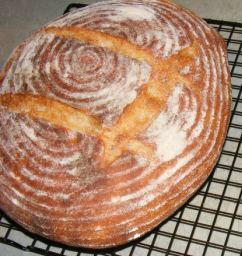 Since I was baking weekly, my starter was being fed at least once each week. 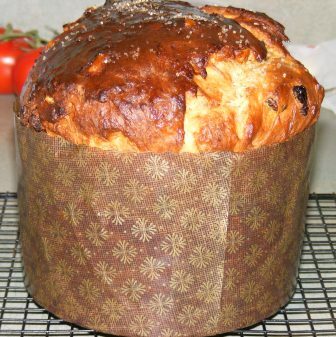 When I ventured into other types of baking, I found I wasn’t using my starter as often. I still fed it weekly, but eventually that became every few weeks, and sometimes even longer. 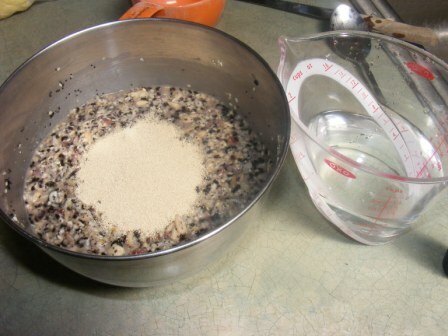 The greyish liquid floating on top of the starter is called “hooch”. 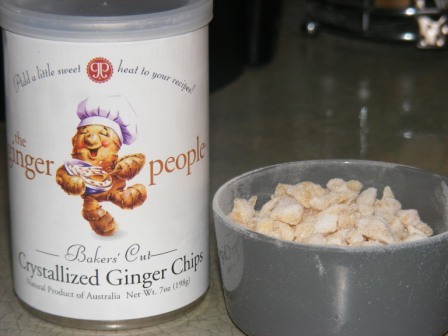 It’s basically just dead yeast cells. 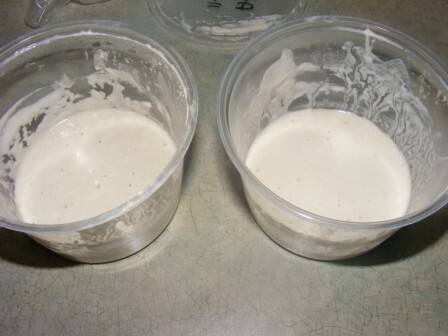 When my starter has a little hooch on the top, I stir it back in before feeding the starter. In this case, I poured it off. 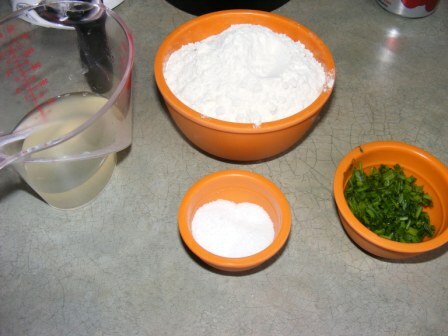 If you read the starter tutorial, you’ll note that I generally feed my starter at a 1:1:1 (starter:water:flour) ratio. 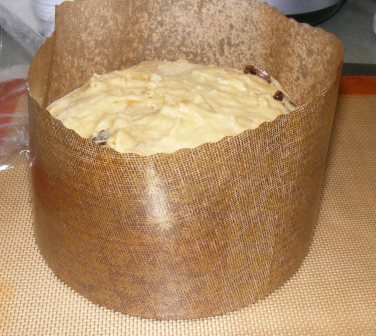 If I know I won’t be using it for a while, I might feed it at a higher ratio, sometimes as much as 1:3:3, to give the yeast more fresh food to work on while it sits in the fridge. In this case, I wanted to ease the starter back to an active state, so I stuck with a 1:1:1 feeding. 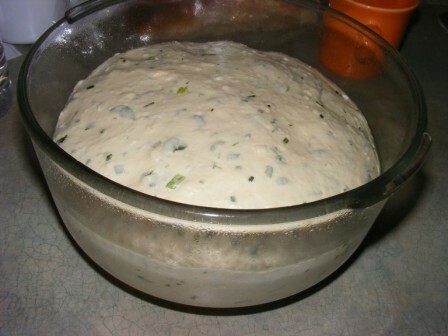 Within 12 hours, my severely neglected starter had come back to life and was bubbling away happily on the counter. 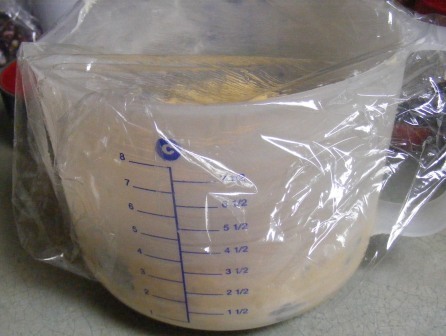 Since I had neglected it for so long, I gave it two more 12-hour feedings before returning it to the fridge. 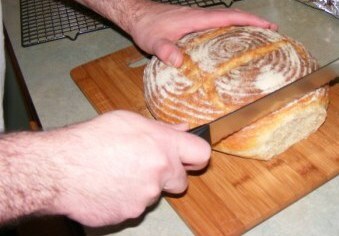 I haven’t baked with it since I fed it, so I got it out today to feed it up again. Because it was well-fed and active the last time I got it out, this time it didn’t look so bad. 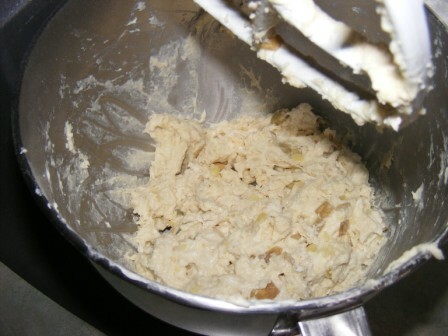 So don’t worry if your starter has been sitting, neglected in the back of the fridge. 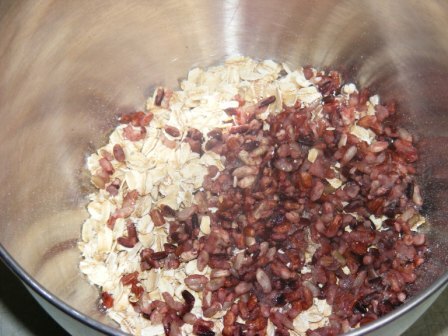 Chances are, if you take it out and give it a few feedings, it will spring right back to life and be as good as new. 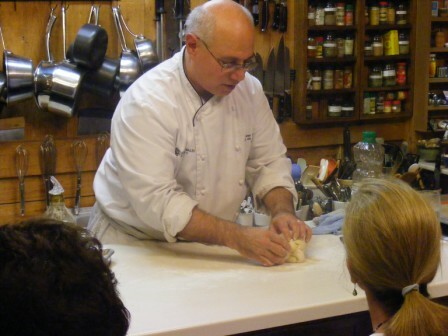 French Fridays with Dorie, the new cooking group dedicated to making weekly recipes from Dorie Greenspan‘s latest book, Around My French Table, doesn’t officially launch until October. The first months’ recipes, chosen for us by Dorie herself, look really great and should be a nice introduction to the book for most people. 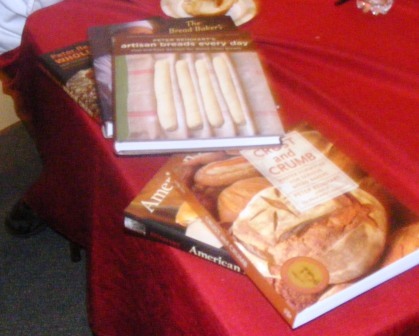 I, of course, couldn’t wait for the launch of FFwD, so I set out to make a few recipes from AMFT on my own. 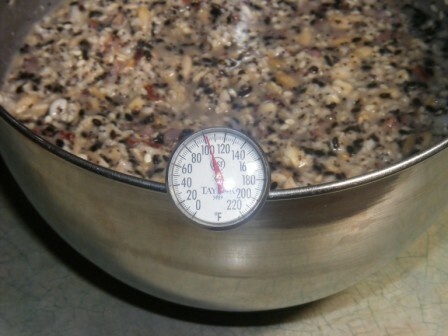 The first recipe I tried, Eggplant Caviar, was a hit and had me ready to try more. 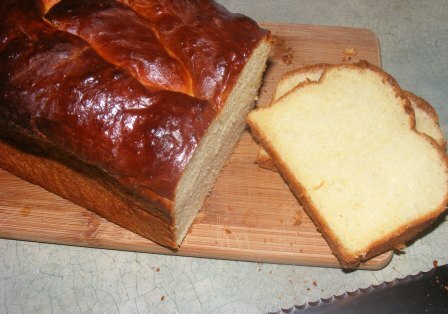 For my second recipe, I decided to make something I already know and love, Brioche. 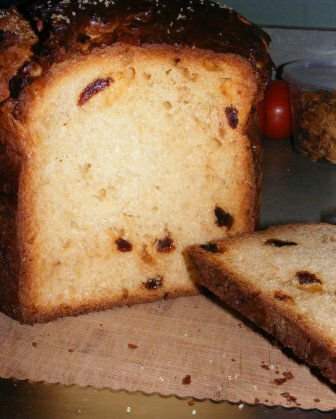 Having made all three brioche recipes from The Bread Baker’s Apprentice, I had an idea what to expect from the dough and resulting bread. 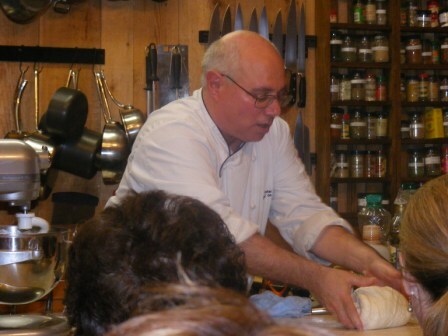 Dorie’s recipe differs from Peter Reinhart’s recipes in that, instead of a sponge, it uses overnight fermentation to develop flavor. 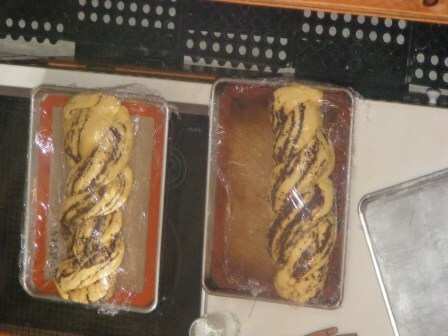 As far as butter content, it seems to be somewhere between PR’s Poor Man’s and Middle-Class Brioches. 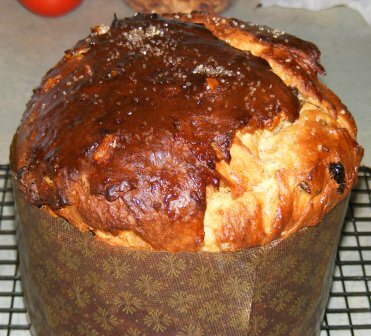 There are two shaping options given in the recipe — bubble-top brioches and brioche loaves — and I decided to try them both. 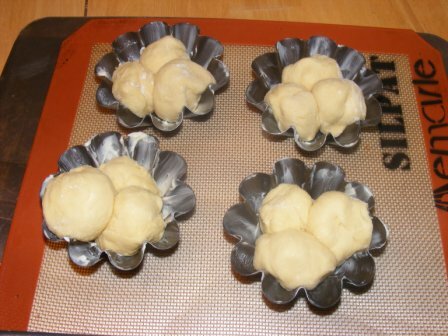 The bubble-top brioches are individual brioches made by dropping three small dough balls into brioche molds or cupcake tins. 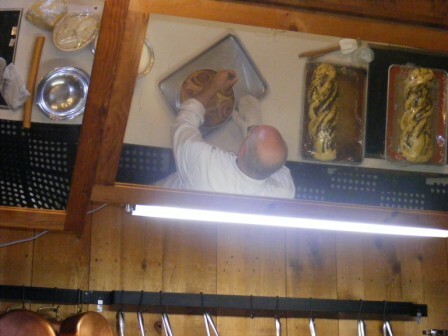 The loaf is shaped by dividing the dough into four pieces, shaping each into a log, and arranging the logs in the pan. 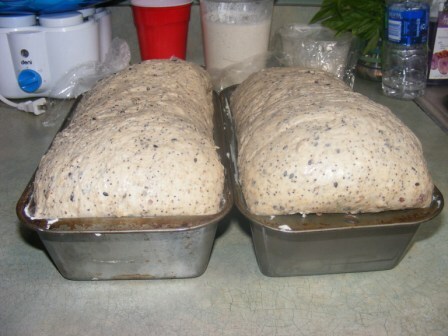 The loaves proofed for about an hour-and-a-half, until the dough filled the pans. 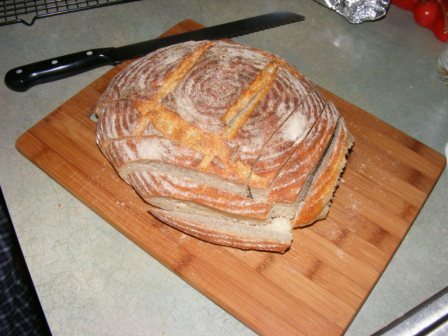 The bubble-top brioches baked for about 20 minutes; the loaf for about 30, until they were golden brown and well-risen. 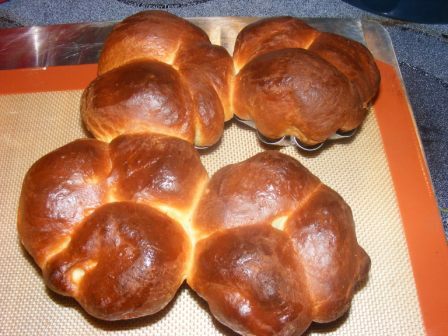 The brioches were delicious — buttery and light. 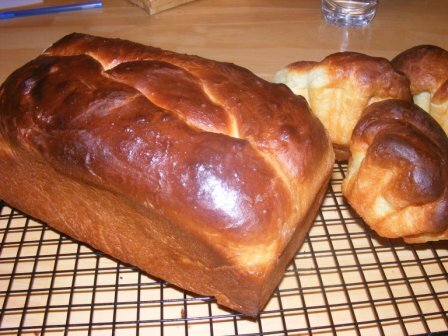 They compared quite favorably to PR’s Middle-Class Brioche, my favorite of the three. 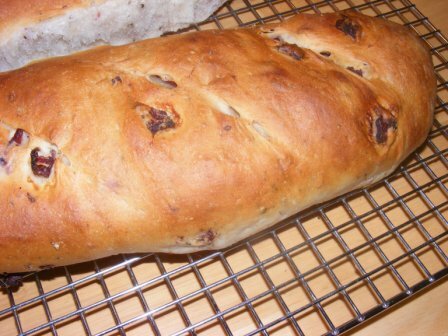 In fact, I would have to try Dorie’s and PR’s loaves side by side to choose a favorite. 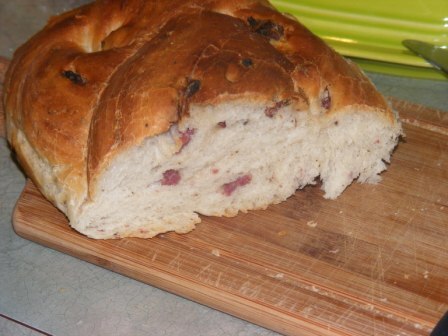 This is definitely a recipe to make again, and another winner from Dorie’s French table. 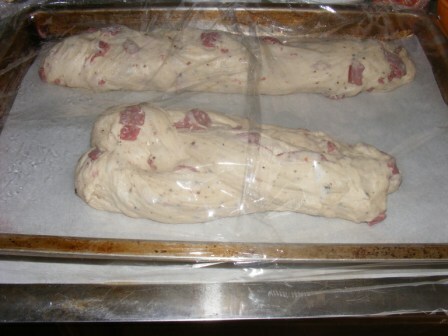 The next recipe I tackled in the Breads section of the Modern Baker Challenge was Prosciutto Bread. 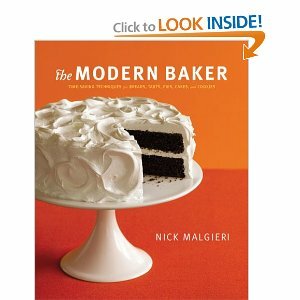 I have committed myself to baking all the recipe in the book, so there was no escaping this one, but it did present a dilemma. I don’t eat pork products, so I was left with the choice between making a bread I couldn’t eat or finding a substitution for the prosciutto. 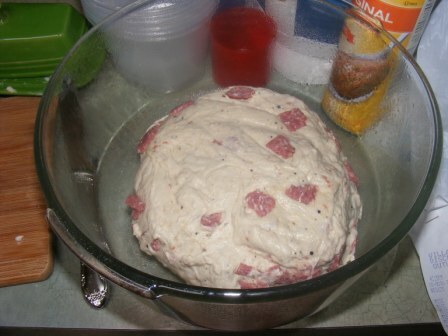 Faced with a similar problem during the BBA Challenge when baking Casatiello, I used Lebanon bologna in place of salami with great results. So I decided to do the same thing here, substituting Seltzer’s Beef Lebanon Bologna for the prosciutto. If you’ve never had Lebanon bologna, it is similar to trail bologna — smoky and slightly sweet. 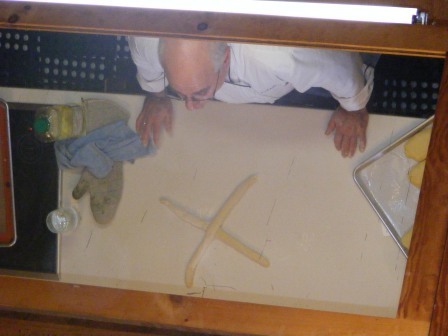 But unlike trail bologna, it is the size of regular bologna and is usually sliced thin for sandwiches. One of my family’s favorite ways to eat Lebanon bologna is to fry the slices briefly in a skillet then eat them on a sandwich. 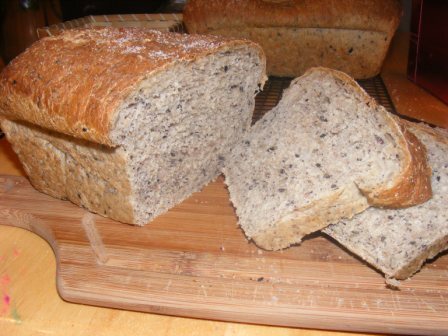 Other than the addition of meat to the dough, this is a fairly straightforward enriched bread that consists of flour, salt, sugar, ground black pepper, yeast, water, and olive oil. 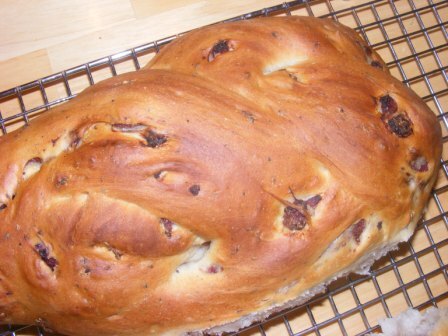 I recalled that when Kayte baked this recipe, she observed that the bread was too salty. Lebanon bologna isn’t as heavily salted as prosciutto, but it is still fairly salty, so I cut the salt in the recipe back from 1 1/2 teaspoons to a scant teaspoon. 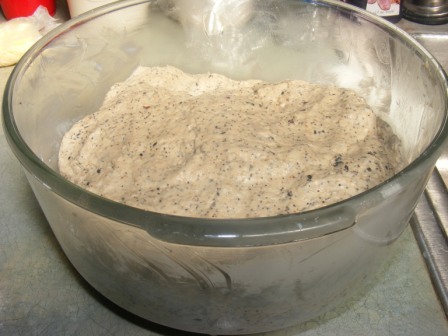 The amount of pepper — 1 tablespoon — seemed like a lot to me, but I went with it, grinding pepper into a tablespoon measure before adding it to the rest of the dry ingredients. 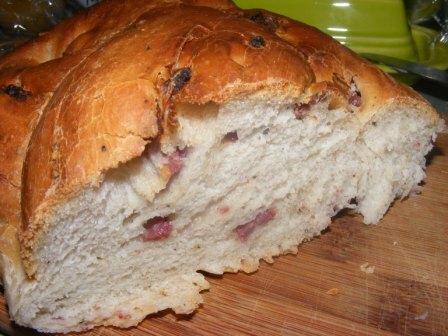 The main thing that distinguished this bread from Casatiello was that the Prosciutto Bread doesn’t have any cheese in it. 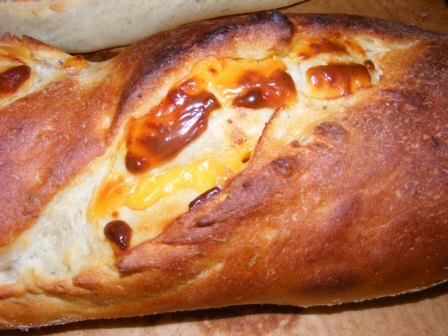 I was a bit leery of this, as the gooey cheesiness was one of the things that made the Casatiello one of my favorite recipes in the BBA Challenge. 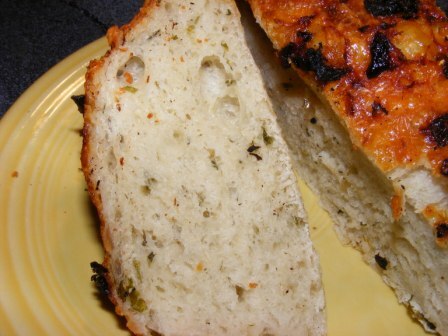 But I wanted to stay as true to the recipe as I could, so I made it without cheese. 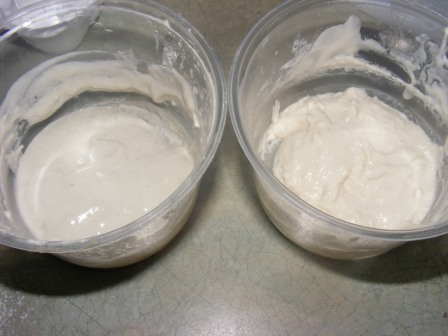 After mixing the dry ingredients, I combined the water, yeast, and oil in a measuring cup, then added them to the dry ingredients and mixed until the dough was evenly moistened. 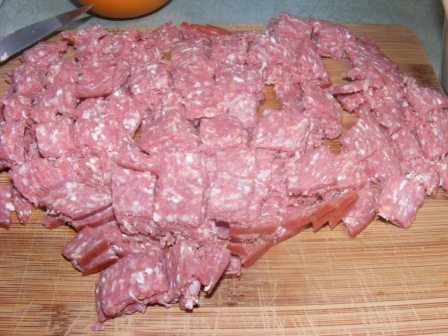 I then folded in the Lebanon bologna. 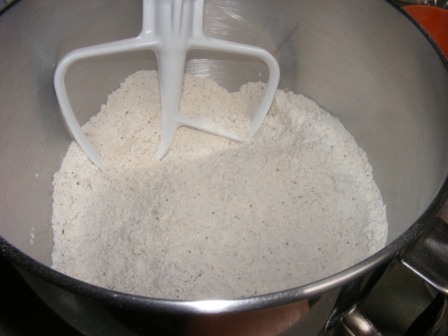 After a brief autolyse, I folded the dough in the bowl with a bench scraper about 20 times. 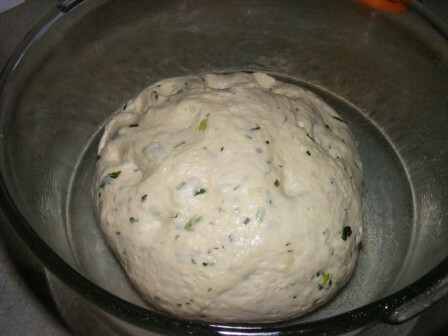 Then I put the dough in an oiled bowl to ferment. 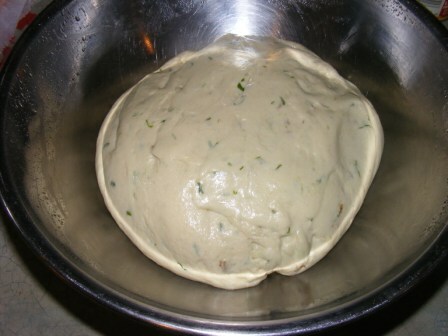 The dough took about an hour and a half to double. 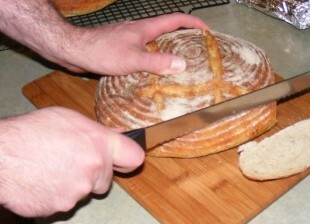 The recipe suggests shaping the dough into batards but also gives the option of making braided loaves. I decided to do one of each. 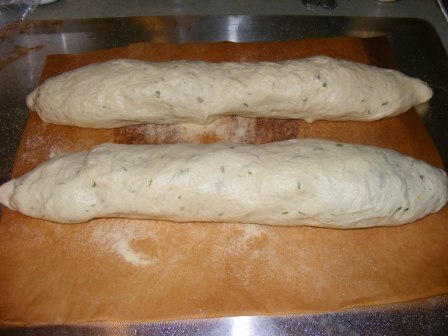 I shaped half the dough into a batard, then divided the remaining dough into two pieces and did a two-strand braid. 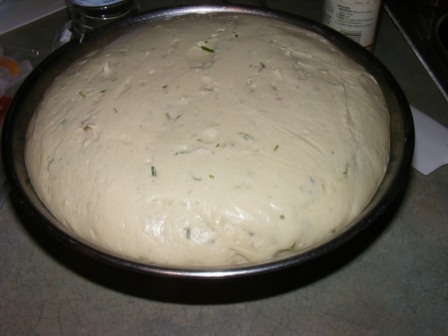 The dough proofed for almost two hours, until it doubled. 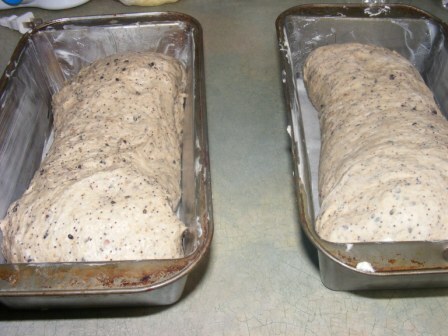 Meanwhile, I preheated the oven to 400° F.
I baked the loaves for 30 minutes — the recipe says 40 — at which time the internal temperature was 195° F and the crust was golden brown. 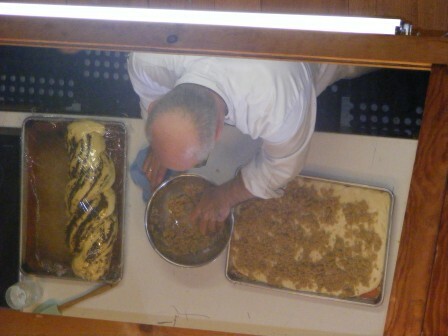 The bread smelled amazing while it baked: there is nothing like the smell of Lebanon bologna while it cooks. 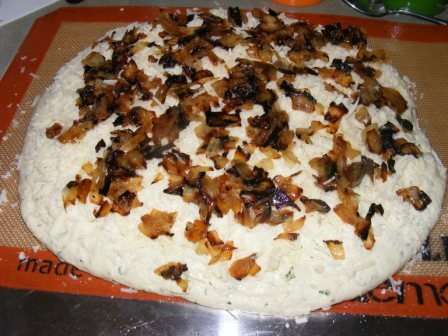 It reminded me of Casatiello, and I was really excited to try it. 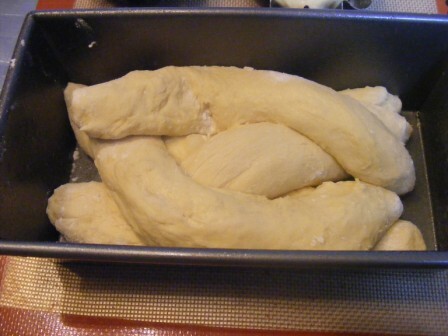 I let the loaves cool for a few minutes before slicing into the braid. 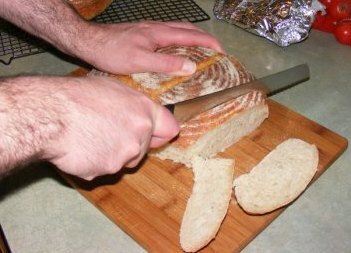 The crumb was soft and studded with bits of meat. 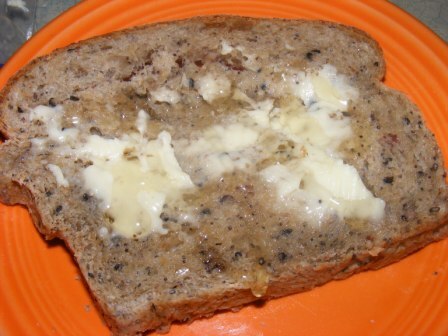 I eagerly grabbed a slice of bread, slathered it with lightly salted cultured butter, and took a bite. It was good. 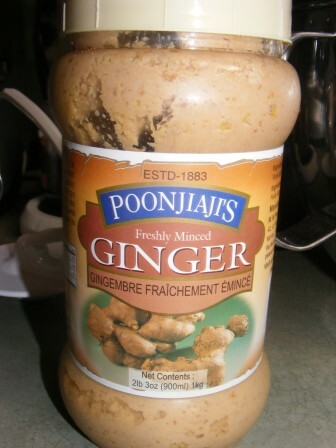 A bit too peppery, but otherwise really good. 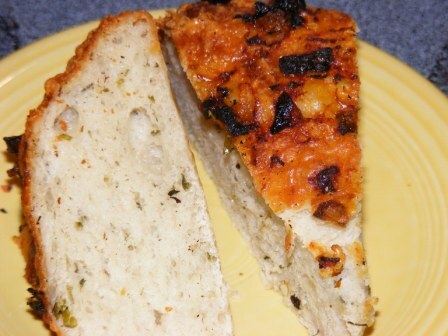 I ate about five slices for dinner and was perfectly satisfied. But it did seem like there was something missing. 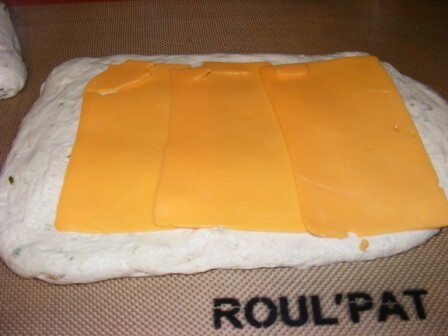 Then it occurred to me — it needed a slice of cheese. 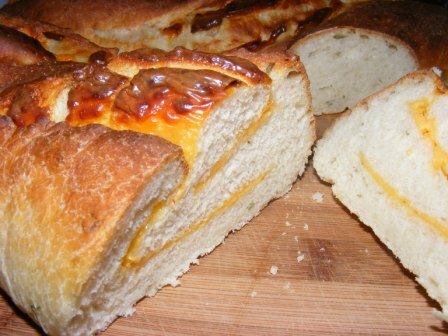 So in the end, it was almost as good as Casatiello and might have been just as good if, like the BBA bread, it had cheese added to it. 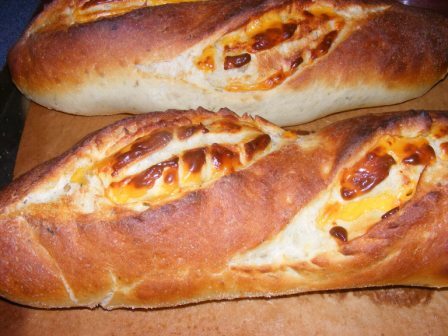 Moral of the story: if you’re going to add meat to bread, you might as well add cheese, too. 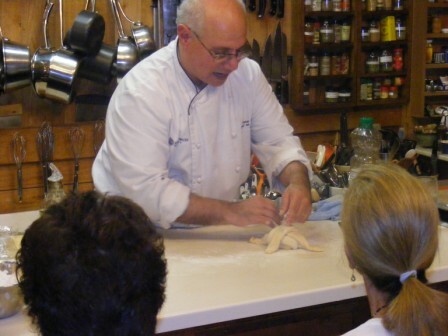 After meeting Peter Reinhart at the Western Reserve School of Cooking and sampling a host of his baked goods, including two kinds of sticky buns, I couldn’t wait for an excuse to do some baking. The Fourth of July holiday weekend — with family visiting from out of town — gave me just such an excuse. 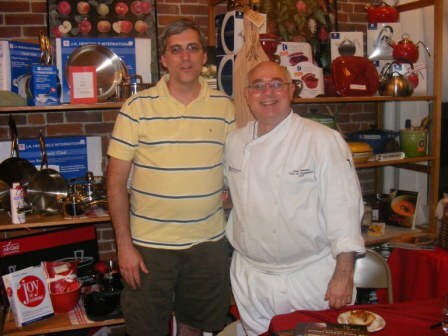 Although I tested recipes for Peter’s most recent book, Artisan Breads Every Day, and of course picked up the book as soon as it came out, before the class I still hadn’t baked anything from it. 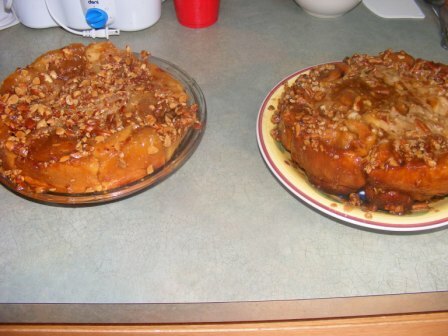 I decided to remedy that by making two kinds of sticky buns for breakfast on Saturday. I made one recipe of sticky buns, and baked half of them with Susan’s (Peter’s wife) formerly secret caramel pecan slurry and the other half with honey almond slurry. 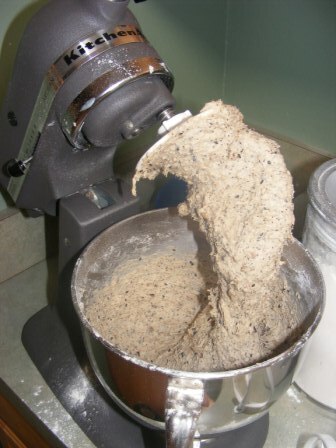 As with many of the recipes in Peter’s new book, the sweet dough came together quickly with very little mixing. 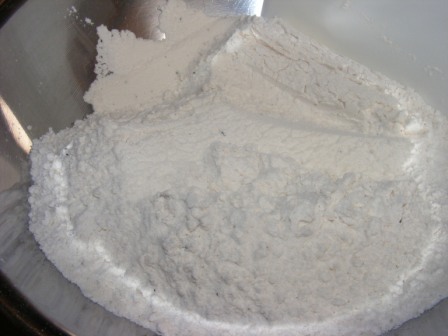 It is kept at least overnight or up to a few days in the refrigerator, where it ferments and develops its structure. 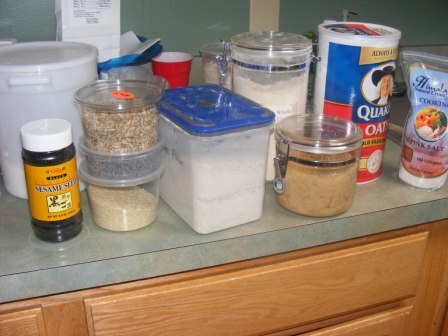 I also mixed up the slurries, so that on baking day all I had to do was throw it all together. 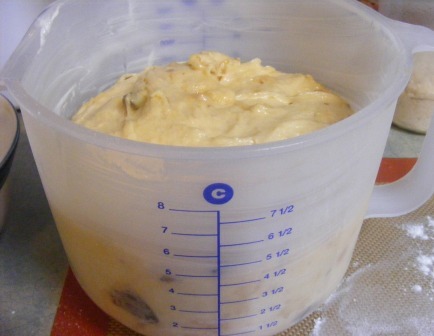 On Saturday morning I got the dough out of the fridge, cut it into two pieces, and let it rest for about 20 minutes while I prepared the cinnamon-sugar mixture and melted some butter. I rolled each half of the dough out to a 12- x 15-inch rectangle, brushed it with butter, and sprinkled it generously with cinnamon sugar. 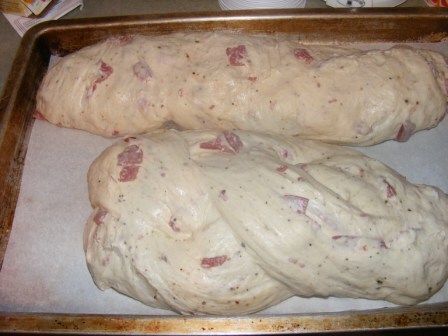 Then I rolled the dough up from the long side and sliced it into rolls. 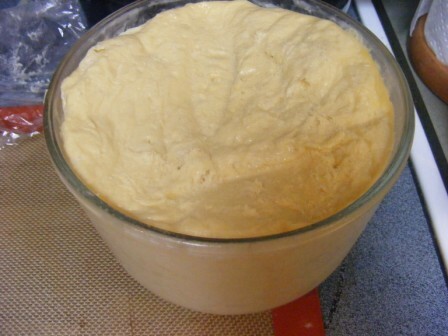 I had to soften the slurries in the microwave for a few seconds, as they firmed up to the point of being impossible to spread. 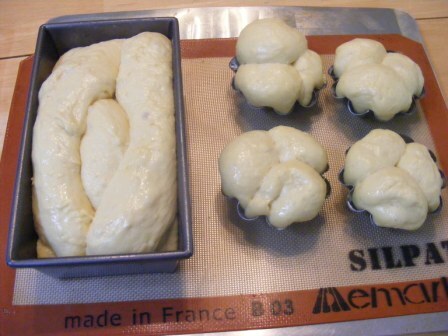 Then I slathered the slurries in 9-inch round baking pans and added the buns. 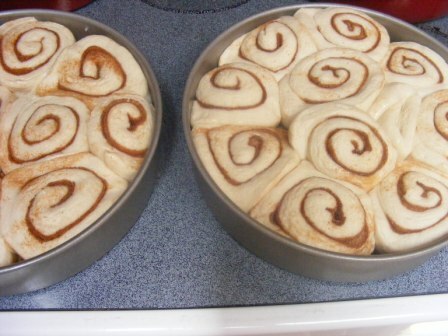 I let the sticky buns rise for about two hours, until they had risen to fill the pans, then prepared the oven for baking. 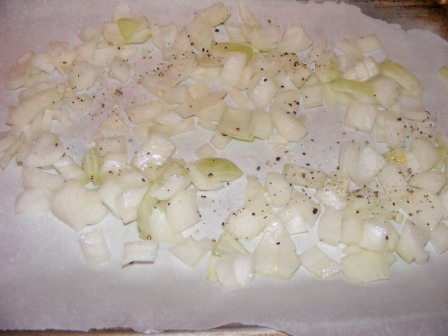 At first, I forgot to set the pans on a sheet pan to catch any overflow, but I remembered before the slurry boiled over into the oven. 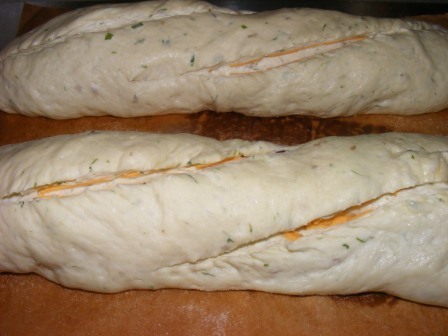 The buns took longer to bake than the recipe suggested. 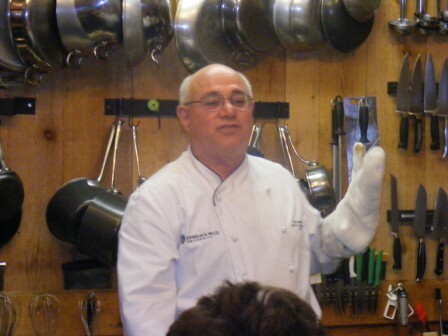 In class, Peter stressed the importance of checking to slurry to make sure it has caramelized before taking the rolls out of the oven. As you can see from the picture, I had pretty good caramelization, with the exception of the very center of the buns made with Susan’s slurry (on the right). 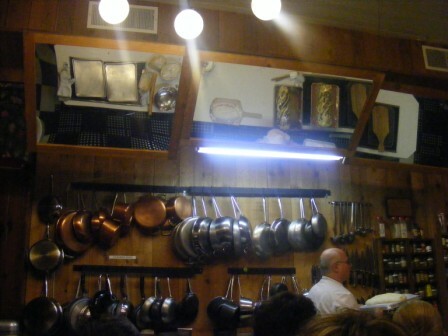 When I pulled the pan out of the oven, it was like I had turned on a bug light for everyone in the house. 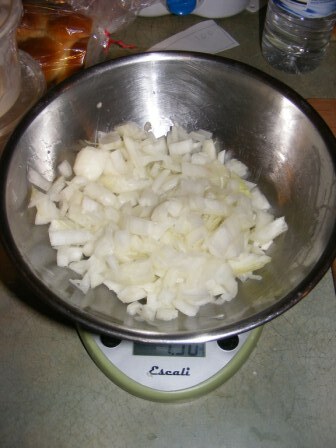 Within a few minutes, when I was ready to cut them, everyone in my and my sister’s families was standing in my kitchen with anticipation. 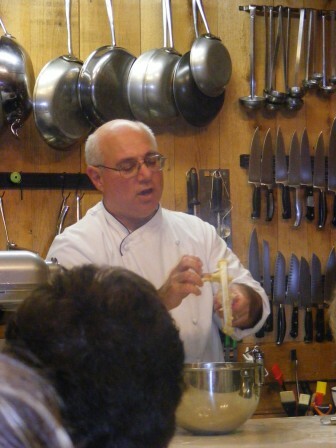 And once I began serving? 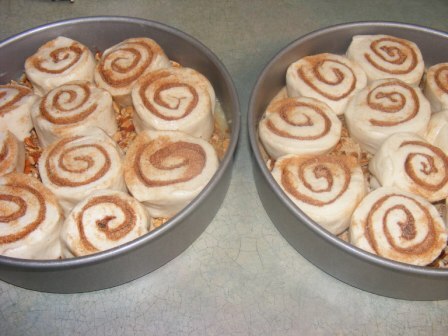 Well, no one left the kitchen until both pans of sticky buns were completely gone. Forgiving my lack of modesty, my sticky buns were every bit as good as the ones we sampled in class. 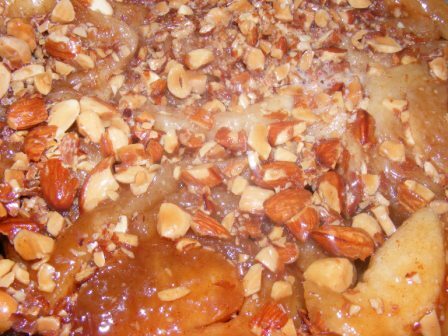 And even though I grew up in Lancaster County, PA, eating traditional sticky buns much like Susan’s recipe, I have to say that I preferred the subtle sweetness of the honey almond buns. But it was such a close call that I think I have to make both of them again just to be sure. 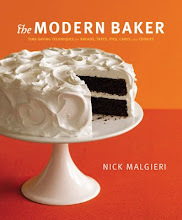 Oh, and there’s one more version in the book I haven’t made yet — creamy caramel. I feel it is my duty to give it a try, too.